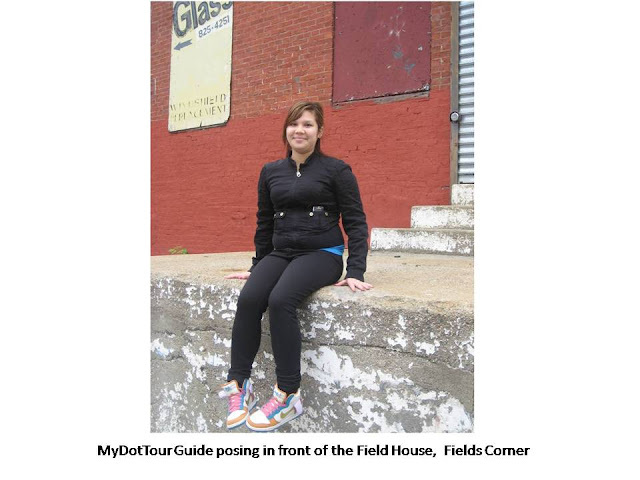 Historic Boston is excited to be partnering with mytown, Inc. and several Dorchester-based organizations to develop MyDotTour—a program of youth-led historic walking tours of Fields Corner, one of HBI’s Historic Neighborhood Centers program districts. 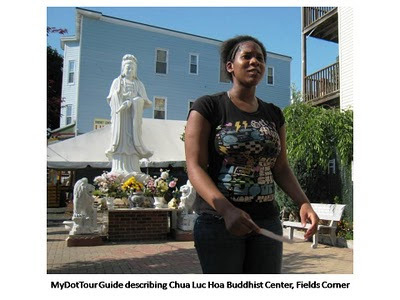 MyDotTour’s local partners also include the Dorchester Environmental Health Coalition, the Dorchester Historical Society, Dotwell, Fields Corner Main Street, Inc., and the Vietnamese-American Civic Association. MyDotTour represents the first time that such a variety of organizations in Fields Corner with varying missions has come together to work on a project, and it will be the first successful attempt to develop a tour program like this in Dorchester. HBI first pitched the idea of bringing mytown-style tours to Dorchester in the summer of 2008, when HBI sponsored a mytown tour of Boston’s South End (their primary tour locale) for representatives from potential Fields Corner partners. The visitors from Fields Corner were inspired by the compelling work of the mytown youth, who research, develop, and present detailed material in a variety of areas—from architectural history, to urban planning, to social justice, to the experiences of Boston’s various ethnic and immigrant communities—at several carefully chosen tour stops in the South End. Soon after, the wheels were turning to to put in place the organizational infrastructure to support a similar program in Dorchester. Among the stops featured on the tour will be the c. 1795 Isaac Newcomb Field House, which HBI’s research established is the original homestead of the Field family, after whom the neighborhood was named. Now highly altered and moved from its original site, HBI is working with its owner on a plan to preserve and rehabilitate this important piece of local history. The MyDotTour youth, all active members of the Vietnamese-American Civic Association (VACA) and the Dotwell Teen Center’s Arts and Multi-Media, are hard at work now polishing their delivery of the stories that they will present at each tour stop. Tien Ha-Ngoc, a Youth Counselor at the Vietnamese-American Civic Association reports: “The youth from VACA have been learning a lot through the MyDotTour project, especially about all the hidden history in Fields Corner. It was also a new experience for them to work with other youth in the community. They started out shy, but the MyDotTour staff has worked hard to build friendships among the youth. Now they're busy memorizing their scripts because the big day is fast approaching!" The first MyDotTours will take place on Saturday, June 5th, 2010, at 10am and 1pm. Tours last about 1 hour and will run again on June 19 and June 26 (at 10:00AM). A registration table will be set up in the lobby of the Fields Corner T station, but attendees are asked to register in advance by calling Allentza at 617-536-8696, ext. 15. The suggested ticket price is $10 for adults and $5 for children under 12. All ticket sales proceeds are used to support MyDotTour’s youth programming in Dorchester. See the press release and the MyDotTour website for more details—and come take a tour!